African American entrepreneurship has been an integral part of the American economy since the 1600s. On the eve of the Civil War, the collective wealth of free blacks was approximately $50 million. In 2006, African Americans earned a whopping $744 billion, a figure that exceeds the gross domestic product of all but 15 nat...ions of the 192 independent countries in the world. 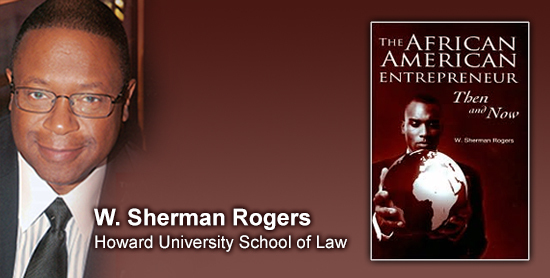 As W. Sherman Rogers so ably demonstrates, African Americans have achieved these economic gains under difficult circumstances. Slavery, segregation, and legally limited access to property, education, and other opportunities have taken a heavy toll, even to this day. Besides providing a penetrating glimpse into the world of black entrepreneurship both past and present, this book urges African Americans to gain financial independence as entrepreneurs. Business ownership, Rogers argues, will bring security, wealth that can be passed to successive generations, and educated offspring with much greater earning power. The African American Entrepreneur: Then and Now explores the lower economic status of black Americans in light of America's legacy of slavery, segregation, and rampant discrimination. Its main purpose is to shine a light on the legal, historical, sociological and political factors that together help to explain the economic condition of black people in America from their arrival in America to the present. In the process, the book spotlights the many amazing breakthroughs made by black entrepreneurs even before the Civil War and Emancipation. Profiles of business people from the Post-civil War period through today include Booker T. Washington, pioneer banker and insurer A.G. Gaston, hair care entrepreneur Madame C.J. Walker, Ebony publisher John H. Johnson, Black Entertainment Television founder Robert L. Johnson, publisher Earl Graves, music producer Damon Dash, rapper Sean Combs, former basketball stars Dave Bing and Magic Johnson, food entrepreneur Michelle Hoskins, broadcast personality Cathy Hughes, former Beatrice Foods head Reginald Lewis, Oprah Winfrey, and many more. As Rogers points out, reading about remarkable African American entrepreneurs can inspire readers to adopt an entrepreneurial mindset. To further that goal and help readers take the plunge, he provides many of the skills, tools and information necessary for business success--success that can help chart a new path to prosperity for all African Americans. courts including the United States Supreme Court. He has been involved in several cases that he presented to the United States Supreme Court on writs of certiorari. He is also a registered stockbroker, general securities principal, and has life and health insurance licenses. Professor Rogers has published important scholarly articles that have been cited by other authors in their works as well as by the judiciary. He has also received numerous teaching awards from various law schools. • Aspiring entrepreneurs seeking the inspiration and tools to bring their own business dreams into reality. • Students and researchers seeking a rich, new resource. How to order . . .